Parents Intended to Give Child Happy Surprise—Now They Will Strew Flowers on Her Grave in Marietta Churchyard. This will be the saddest Sunday with Mary Phagan’s family since that fatal Sunday just five weeks ago when the little girl’s body was found hidden away in the basement of the National Pencil factory. 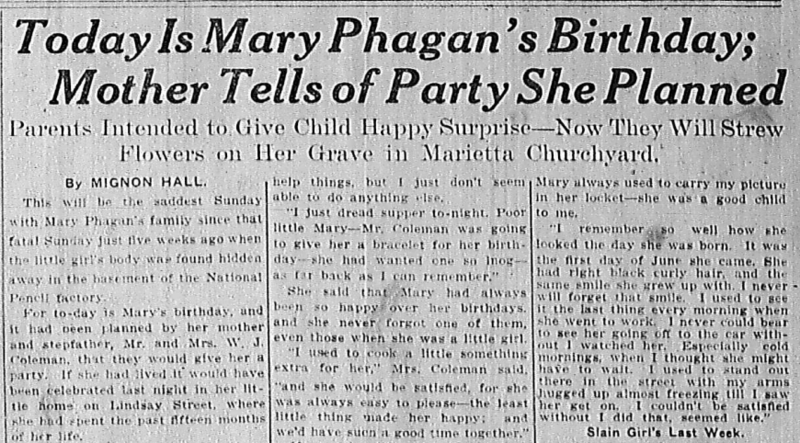 For to-day is Mary’s birthday, and it had been planned by her mother and stepfather, Mr. and Mrs. W. J. Coleman, that they would give her a party. If she had lived it would have been celebrated last night in her little home on Lindsay Street, where she had spent the past fifteen months of her life. Instead of that, there is a shadow over the household, and she was spoken of with an ache in the throat and tears. Where last night would have been so happy for Mary, there was silence, and to-day the family expects to go to Marietta to weep above the little mound where she rests and lay flowers on the grave. Was to Have Been a Surprise. Mary’s birthday party, Mrs. Coleman said, was to have been a surprise, and as she told of it Saturday morning over the ironing-board—spoke of her other childish birthdays, the things Mary said and did, and all the tender little recollections of her a mother’s heart holds dear—her voice choked with sobs so that she could scarcely speak. “It would have been the child’s first party,” she said simply. “The poor little thing never had had much in her life—she had to work so hard. It was Mr. Coleman’s idea. He thought it would be nice for her. He was like a father to her, anyway, and the only one she had ever known. Her own father died before she was born. The mother’s lips twitched and her hands trembled as she straightened out the white waist and ran the iron across it. “Seems just like I can’t get over it,” she said. “I can hold up pretty well for a while, and then it seems I just have to cry it all out. I know that all the tears in the world won’t help things, but I just don’t seem able to do anything else. She said that Mary had always been so happy over her birthdays, and she never forgot one of them, even those when she was a little girl. Most of her life Mary had lived in the country, her mother said, and she had always worked, for Mrs. Phagan was a widow and there were four children besides Mary. 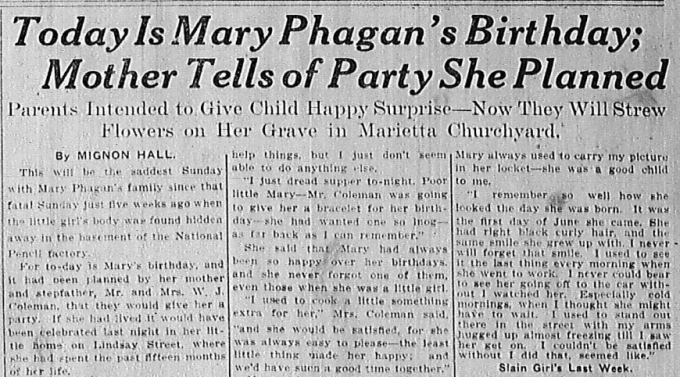 The family had first lived six miles from Marietta on a farm, and then later in Alabama, till they moved here a few months ago, when Mrs. Phagan married Mr. Coleman. Mrs. Coleman dropped down in the chair, her hands listless in her lap. It was a few minutes before she could speak again, and then it was to tell of how the days went without the child. It seemed, she said, like she just couldn’t remember that Mary was dead. Sometimes when she would be cooking in the kitchen she would be expecting her, and two or three mornings she had called her when it was time for her to get up. “It’s so quiet in the house,” she said. “Mary was always laughing and talking, telling what she had done and what she was going to do and all that. Me and the children are just like we’re dead without her. Mary always used to carry my picture in her locket—she was a good child to me. And then Mrs. Coleman told of the last week before Mary had been killed. The child had mentioned her birthday several times. She was not at work in the factory and had helped around the house. She had baked her first biscuit one day as a surprise to her mother. And she went into the other room and brought back a short blue dress with white embroidered collar and cuffs. Mrs. Coleman said she hoped some day to erect a stone over Mary’s grave. They were too poor to do it now, though, and they would have to wait, she said. What they would get she did not know—but something simple and sweet—like Mary was.